If you have a fanatical family member who gets excited about comic books, knitting, or even paper dolls, there is a themed vacation in your future that won’t cost a fortune. Last year, for example, we took our train-obsessed sons on a few train museums within a two-hour drive of our hometown. I was surprised to see just how many destinations were centered around this hobby, and the kids were delighted to experience these enormous machines up close and personal. Many people envision months in the jungle when they hear the words “mission trip,” but many of the non-profit-based trips our friends and family have taken weren't anywhere near that exotic (or dangerous). If you’re already hooked into a church or charity group, you can ask what opportunities they’ll have this summer for families wishing to pitch in. Even kids can get involved with some of these tasks: teaching vacation bible school in urban areas, working on a community garden in an elderly housing project, or cooking meals for construction workers in a tornado-stricken area, for example. Many of these activities can be found within a day’s drive of your city, and children will take away a sense of appreciation from their time helping others! Did you know that Johnny Carson lived in Norfolk, NE or that Donna Reed lived in Denison, IA? Both are within hours of my house, and we’ve taken our kids to see the homes and visitor’s centers for both celebrities in attempt to round out their knowledge of historical pop-culture (and to see some pretty cool destinations on a dime). While art museums and theme parks are exciting, these often-missed spots have an element of charm that should not be disregarded. Most communities with a famous former resident also have quaint restaurants, shops, and local businesses that would appreciate your support! Google your town and those around it to see what famous authors, actors, presidents, and historical figures made your home theirs, too. Spend some time before embarking to be sure you have a nice background to share with the kids as a “prep session." 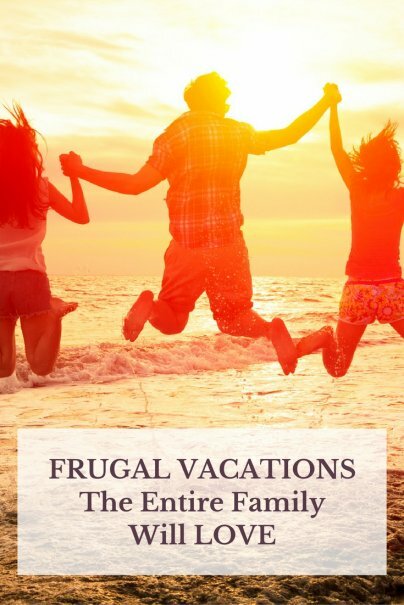 These are just a few of the more memorable vacations we’ve taken over the years that have created fond family moments and kept our budget in check. Do you have some frugal vacay ideas to share? I have always been interested in WWOOF (World Wide Opportunities on Organic Farms). You pick the destination/farm and for one-half day of volunteer help you receive food and accommodation! Therefore the only substantial cost would be getting there. I've heard of it and thought it sounded interesting. My kids are 13, 8, 7, 5, and 2, so maybe when they get a bit older? Great article Linsey. A note too about "hobby trips" is that I would expand this to amusement park trips. Not only are the prices at the gate for some places (not Disneyland!) such as the San Diego Zoo, or the Monterey Bay Aquarium, very reasonable, but you can get even better discounts if you know where to look. For amusement parks, Costco Travel runs pretty good deals and even to Universal Studios Hollywood right now you can get a 2-day pass for $64 per person. Not too shabby for two days of fun! It really stinks that amusement parks, water parks, museums, zoos and aquariums cost so much! But what a great idea to hone in on a special interest of one of your kids and take the entire class for a special day for that person. Not only will they all probably enjoy the day together, the others will look forward to when its their turn. There are a lot of museums that operate on very low admission fees, especially for kids- military museums can be some of the most interesting and are always looking for money to help support the preservation of the armed forces!